Here we go, onto volume 4! Tatari wanted to finish half of volume 4 before the new year rolled in, but unfortunately won't be able to do so due to probably going out and getting drunk. Well, that's what I'll be doing. So don't expect a chapter until after January 2nd. Almost done with volume 3. Expect the next chapter in a day or two. So, my two page spreads have been having a bit of a problem with CDisplay. I decided to check into this problem and discovered that CDisplay will not correctly display any image created in Photoshop with a transparent background. I'll avoid this problem in my future releases. Double release this week! Enjoy. First Grendizer, now this? You can't stop us. Five more volumes to go for Getter Go. Also, I've started working on the original Cutey Honey manga. I'll be releasing that volume by volume, so look out for that! Well, isn't this from out of nowhere? 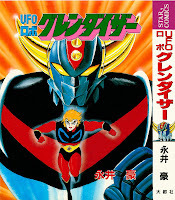 This is the original version of UFO Robo Grendizer by Go Nagai. It's one volume long, and pretty different from the anime. This project was actually a commission by one of our readers. So, this wouldn't have been possible without him. Thank you! This group may go by the release name of "Getter-Robo", but I'm personally open to all Dynamic Pro titles, if there's a willing translator to work on it. If I ever get a chance to do any other titles by Nagai/Ishikawa or Dynamic Pro in general, you can be sure I'll do it. I hope you enjoy UFO Robo Grendizer! Here it is! It's good to be back on track. Though it may seem like we only took a couple of days to do v2 ch1 and ch2, remember that I had v2 ch1 done about a week ahead of time. So the next chapter will probably be out next week/weekend. Enjoy, this is a really good chapter. The story really takes off at this point. First off, I'm sorry about the long delay from our last release to this one. We actually had volume 2 chapter 1 done a bit before the last chapter of volume 1 due to some mishaps. The Volume 1 compilation features updated editing. I went through the older releases and found the minor mistakes I had made in my rush to release, and fixed them accordingly. So I suggest downloading the volume compilation. We should have the next chapter out within a week, I don't think anymore mishaps like this last time will happen for a while. I had this one done for a couple of days now, but my internet connection was out. Oh well. Anyway, chapter 4 may a take a little bit, I don't know exactly when I'll get the script for it. Volume 2 is probably going to take a little bit to start, since I'll have to wait for the books to ship. But once that hits, things will go a lot faster. Also, this chapter was done by our French friend! He's a great guy. B is working on the last two volumes right now. Tatari will do a bulk of the translation from French from volumes 2-5 once we get them shipped to his location. 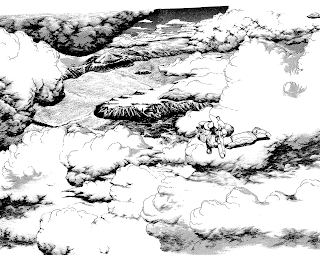 Lionel did this chapter, will do chapter 4, and will help with anything from volume 2-5 when he can. Everything is going exceedingly well. ...And now the project takes off! After going through the manga again carefully, I found that there were indeed chapters, but they didn't use chapter titles to separate them, so I had to closely follow the pages and I found that each volume has 4 chapters with each roughly 50 pages. We need to obtain these, for having them will make our scanlation go much, much faster. As this rate, we're going at a snail's pace, which really bothers me. We found a good shop to buy them from, it's going to cost $46.42 and we have $36.13 saved up. We will get the money eventually, but that last bit might take a while, so I put up a donation button in case a couple of you don't mind contributing to the fund. That's it. Just thought I'd throw that out there. 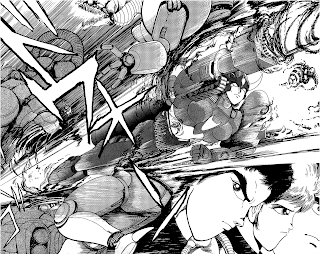 Getter Robo Go is still progressing. The basic run down right now is that the translation is moving slowly, but we're working at it. I've recently ordered the first four issues of Viz's old Getter Robo Go localization to check out their translations and see if I can use them to speed things along. There are seven issues in total, so it'll probably cover the entire first volume. 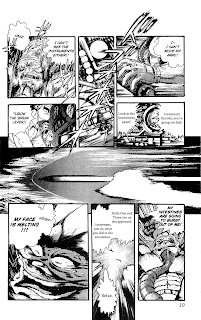 Currently, we have the first 20 pages of Getter Robo Go translated along with some other misc pages from other volumes. I've been pumping out cleaned scans and joining pages left and right! So when we have the scripts, I'll have it out ASAP. Hey all, Shin Getter Robo is now complete! We're still working on Getter Robo Go! Remeber, our next release will have a bit of a delay! individual chapters. So we're only able to do full volume releases for that series, so please be patient with us. Also, after tomorrow's release, our translator will out for a couple of days. After he gets back, we'll complete the final chapter of Shin Getter Robo! Edit: Goof on my part. I didn't remember to put our new member, dx int, onto the credits. He's going to be doing the RAW cleaning from now on. While I just do the typesetting now. This is a release done by myself, Anonymous K, Choutte and Darkrufy a bit ago(4/22/08). Though not Getter Robo related, this is Go Nagai's masterpiece that deserves to be read by all. If you haven't read this, download it now. This comes with my highest recommendation. Edit: Volume 4 link updated. Today marks the completion of Shin Getter Robo volume 1! Here's a 2nd version of chapter 3 that fixes some errors and adds a credit page. The translator for Getter Robo Go has gotten ahold of his books and is starting to translate tomorrow! Everything is going great! Spread the word on Getter Robo! C-K, translator for these releases, is an incredibly awesome guy. He dished out this chapter incredibly fast. All props go to him! Without him, this wouldn't be possible! Get the new chapter right here! Quick note: Forgot to put a credits page in this release. But it's the same as chapter 2. Edit: link updated to version 2. Shin Getter Robo First Release! 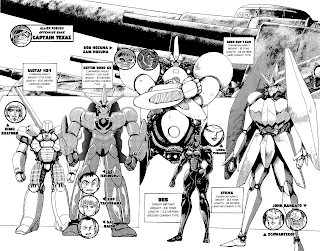 Today marks this blog's debut and the first release of Shin Getter Robo from us! 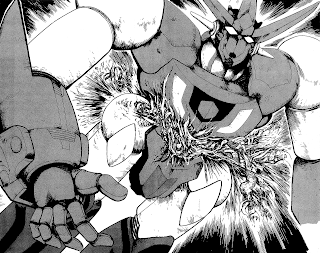 Our first release is Shin Getter Robo chapter 2, which you can get here from mediafire.